the advantage that the message is immediately delivered to the participants mailbox, every time a new alarm is available. E-mail is the prefered communication medium of the participating teams. For the administration oft the eCSIRT.net alert mailing list Mailman, the Mailing List Manager of the GNU Project, is used. Mailman is free software for managing electronic mail discussion and e-newsletter lists, distributed under the GNU General Public License. Mailman provides a couple of web-based features (e.g. subscribing and unsubscribing to a list). But in this case we have to deal with a closed user groupand a seperate registration is required. Therefore a user cannot subscribe or unsubscribe himself to the mailing list, this is done exclusively by the eCSIRT.net management. The security policy of the SecureMail Gateway only accepts incoming mail which is encrypted and signed and which was sent by a registered team. Therefore it is insignificant, whether the message is protected with S/MIME or OpenPGP (GnuPG). After the message was decrypted and the sender verified, the message is forwarded to the list manager. In the last step all messages received from the list manager will be signed and encrypted by the SecureMail Gateway. If a X.509 certificate of a team is available, the message is protected according the S/MIME standard, otherwise the PGP standard is applied. In the following step an IODEF-XML object is generated from the entered data. 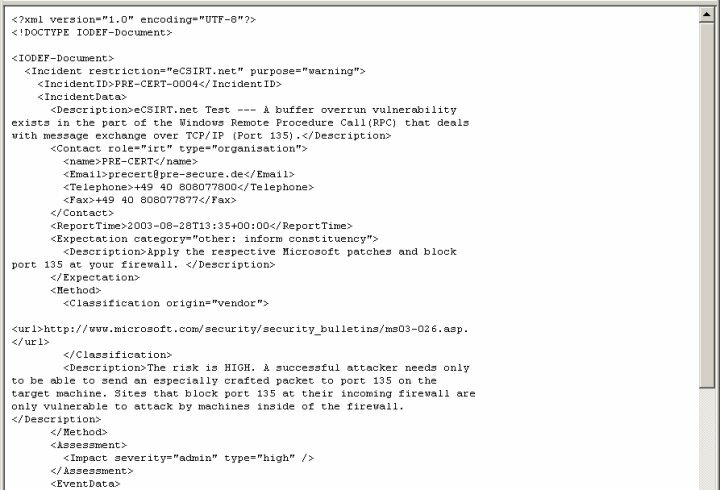 For the IODEF processing the "Incident Handling Shell (IHSH)" is used. This tool bases on the results of AirCERT, a work done at the CERT Coordination Center (CERT/CC). For further information, please follow the links on the IODEF product list. Besides the IODEF object an ASCII representation is also created. Finally both objects are embedded in a MIME message and transmitted to the mailing list. 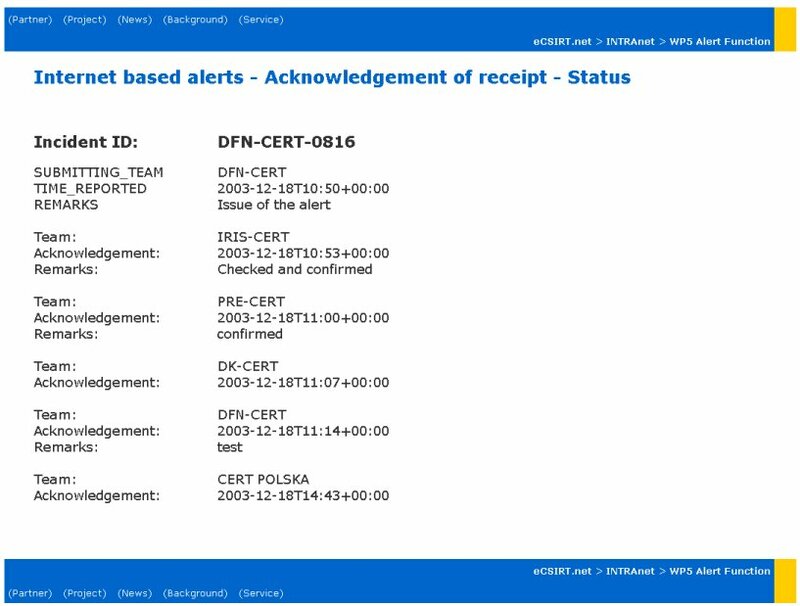 After the first experiences with the in-band alert function it was recognized that a confirmation of the receipt of a message would be very helpful regarding the use of the out-of-band function. Therefore this functionality was implemented afterwards. This function was also realized on the basis of Web-forms. The technical realization corresponds to the description before. 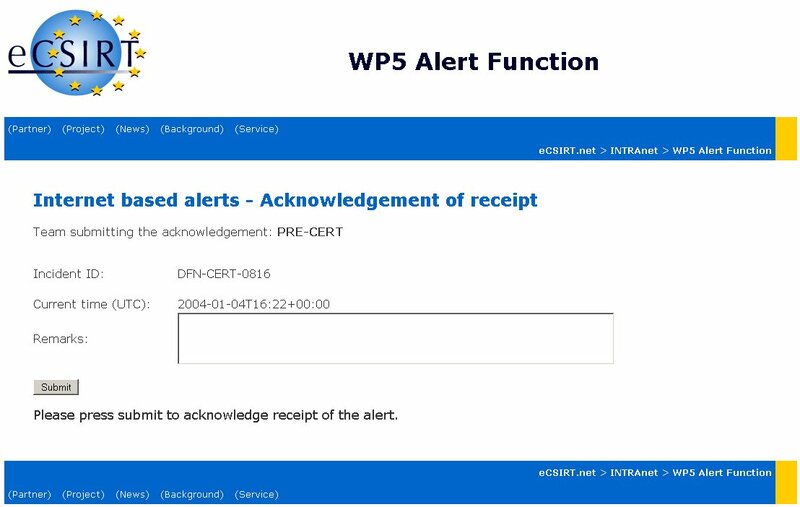 During the generation of an alert message with the WP5 alert web-form a corresponding data object is produced on the server. This object can be modified or watched with corresponding web-forms. A detailed description of the function under the point of view of a user can be taken from the following chapter. For the participation in this service only low technical requirements have to be fulfilled: just a functional email address and a corresponding OpenPGP-Key or X.509 certificate. The correctness of the most important contact information is ensured either by the TI accreditation framework or by the eCSIRT.net project management (for partners and liaisons). A detailed description of the procedure is available from eCSIRT.net WP5 Alert Policy. X.509 Certificate and secret key for accessing the web-forms. 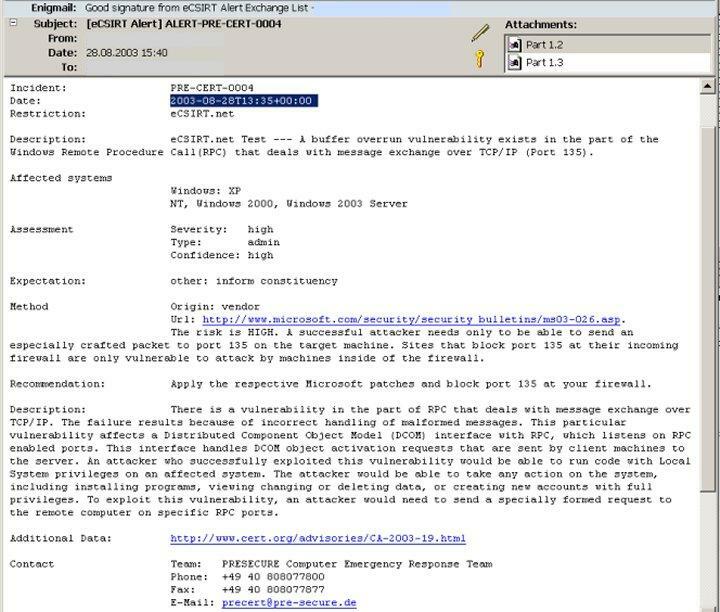 The exchange of information, the message format (IODEF Alert Profile and in particular the aspects of communication security was described in the WP5 Alert Policy. The integration of the alert function into a Incident Handling System or other workflows lies in the responsibility of every participating team so that no guideline is required in this place. Remark: Only signed and encrypted messages will be accepted by the eCSIRT.net Alert Exchange List. For all teams which haven't integrated the alert function into their Incident Handling System yet a web-form is offered for drawing up and distributing alerts. 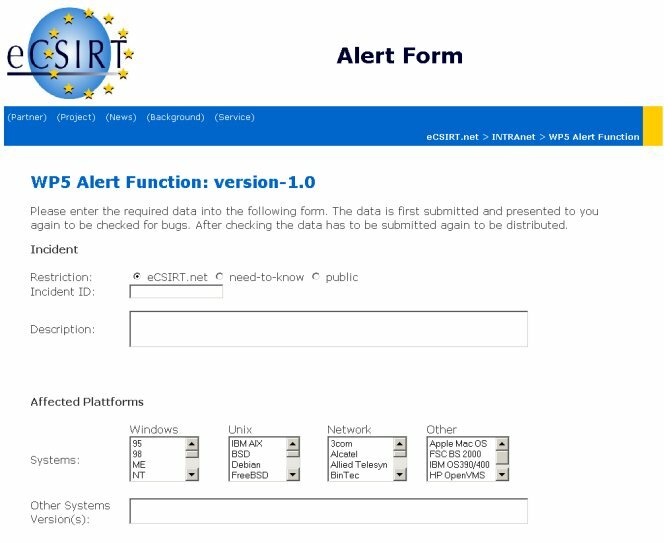 The WP5 Alert Form is made available only within the eCSIRT.net Intranet. 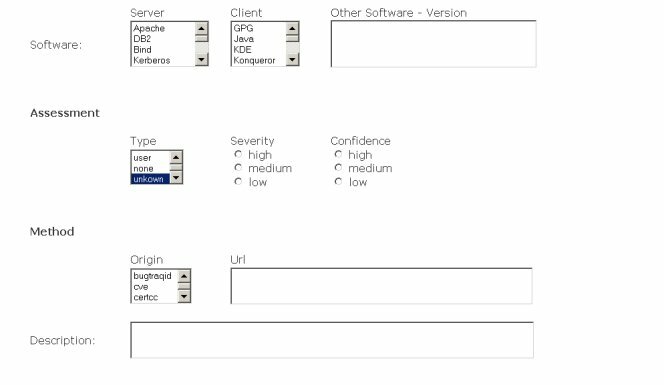 In order to access the protected area of the eCSIRT.net Web-server a two-way authentication with Client and Server Certificate is necessary. Furthermore the communication is protected with SSL. If desired, the X.509 certificate (team certificate) and the secret key will be generated by the eCSIRT.net-CA and submitted to the teams using OpenPGP encryption and authentication (details will be given in the WP5 Alert Policy). Incident Restriction Checkbox Indicates the disclosure guidelines. In this profile this attribute is used globally. Incident-ID Text unique identifier assigned by the team that generated the document. The name of the team is added automatically. Description Text A shortdescription of the incident. Assessment Type Listbox The type of impact. Permissible values are: "admin, dos, file, recon, user, none, unkown and other". Severity Listbox An estimate of the relative severity of the activity. Permissible values are: "high, medium, low". Confidence Listbox The confidence the CSIRT has in its assessment. Permissible values are: "high, medium, low". Method Origin Listbox The name of the database to which the reference is being made. Permissible values are: "bugtraqid, cve, certcc, vendor, local and other ". Expectation Category Checkbox The type of action requested. Permissible values are: "inform constituency, inform public and other". StartTime DateTime Timestamp for the start of the attack. 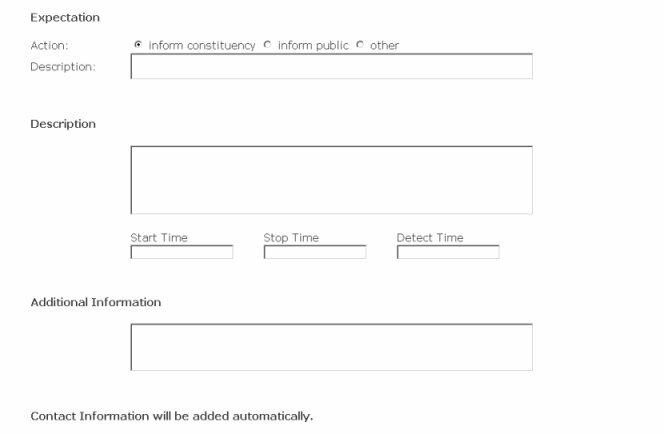 The following fields will be filled out automatically. A detailed description of the eCSIRT.net IODEF Profile can be gathered from the eCSIRT.net WP2 Deliverable "Common Language Secification". The inventor of the message as well as every other participating team can query the current status of the alert message with the following web-form any time. eCSIRT.net WP5 User Guide for the Telephone based Alert System.